We'll be making a light wrap-around hatchet with a Viking-ish feel to it (We will be drawing out cusps on the cheeks of the eye). The body of the tool will be mild steel bent around the eye and forge welded together. A spring steel edge will be welded in so that the tool's edge can be hardened and tempered. The finished head will be around 8oz. 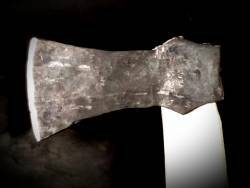 This same recipe and collection of techniques, once the student has a handle on them, can be used to make ax or hatchet heads of any size the forge will get hot enough. Drawing-out, shouldering, spreading, measuring, bending, *welding*, heat-treating, sharpening. It's not expected that we will get all the way to hanging (putting the handle in) the hatchet, but there will certainly be discussion of the process. The student will 18 or older and will have finished at *least* Rudiments 3 and be at least slightly comfortable with forge welding. Having taken our Nothing but Knives and/or DIY Off-the-Grid Guerilla Patternwelded Billet classes would be a good thing too. Gift Certificates for A Hatchet in the Viking Style are available. If you're interested in taking A Hatchet in the Viking Style and it's not on the calendar, please tell us using our Waiting-List Page.